Henry County’s largest goal is for all of their students to be college-, career-, and life-ready. The district began the shift to blended and personalized learning as they believe it can help all of their students -- across all 50 schools -- gain increased agency over their learning. As a district, officials felt it was important to have a shared vision and organizing principles for personalized learning in order to both create consistency across the district and to provide a clear “north star” to guide schools in their own journeys. Henry County created five core tenets, or “pillars,” of personalized learning to help schools manage the change process. 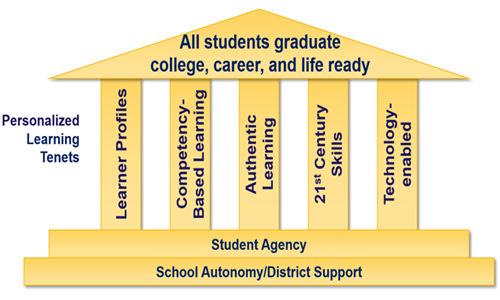 The pillars spell out the basic components of personalized learning that each school in the district must work toward. Each tenet, however, is intentionally broad, and schools are expected to define what they will look like within their own walls. Learner Profiles - Every student should be known well. The district has built a Learner Profile platform that schools across the district are in various phases of implementing. Competency-based Learning - Education should not be defined by seat time but by students’ ability to demonstrate mastery of content and progress through their learning based on this mastery. This requires clearly articulated competencies about what students know and can do. Authentic Learning - Students should be engaging in deep problem solving and spending time learning in their communities. 21st Century Skills - In addition to content competencies, students also need to learn to effectively communicate, collaborate, think critically, and think creatively. Technology-enabled - Technology is not a primary driver of education. It is a tool that can help manage students moving at different paces, increase access to learning resources, and connect students and teachers around the world.